The documentary the skeptics don’t want you to see! 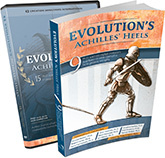 Thanks to you, the book Evolution’s Achilles’ Heels has been a huge success. In just a couple of weeks our international offices may run out of stock before the books from the second printing arrive! As our supporters know, we have been working even harder on a documentary by the same name. We are on schedule for the world premiere in Atlanta on Oct 17 (and you are invited) Things are shaping up for Evolution’s Achilles’ Heels (EAH) to be one of CMI’s most significant projects ever. Happily, our efforts have caused some buzz among the skeptics. Unhappily, that buzz has led to a vexatious attempt at suppression. Our first online announcement came when we posted the Producers’ Chat video on YouTube in August 2013. This was a simple interview with Gary Bates and myself to explain the reasons for the project and how it was going. It garnered only minimal attention, which was fine as it was made just to explain to our supporters where their donations went. Five months later, everything changed! In January 2014, we posted the first official trailer for the EAH movie on YouTube. This received a little more attention and was almost immediately ‘mirrored’ (pirate copies appearing on YouTube). The duplicate videos had the effect of reducing our ‘hit’ count, meaning our videos were bumped down the search list. We have had enough experience with verbal vitriol, insults and objectionable language from the opposition to know that we should turn off the comments feature for the video. Yet, the mirrored versions had comments enabled. Also, several of the mirrors were very low quality (one looked like it was filmed by a hand-held camera phone), making it look like we were creating poor-quality material. And, of course, there was no way for our supporters to know which video was legitimate, meaning that by watching one of the others they were inadvertently helping them and hurting us and being subjected sometimes to disgusting language in the comments. “Denial of free speech” and claims like that were used to justify breaking copyright law. YouTube at least acknowledged our rights and they deleted the mirrors promptly. Yet the damage was done. They had blunted our inertia during those first critical days. After we posted the second trailer in May of 2014, a skeptic blogger posted a link to the trailer with several key words listed, one of which was “crazy people”. This post was picked up and mirrored by many other blog sites, including Richard Dawkins' site. Overnight, we had over 2,000 ‘dislikes’. Since the rank of a video in YouTube is based in part on the like/dislike ratio, this had the effect of driving the trailer off the first results page. We were happy that the skeptics were aware of our project, even if few of them actually watched the trailer, but their attention had a huge negative impact. Not satisfied with the fact that our videos were still available online, sometime in August 2014 all of the highest-ranked EAH-associated videos were flagged as “inappropriate”. There is no reason for YouTube (owned by Google) to flag this video, except based upon complaints. Flagging our videos as inappropriate was obviously done with malicious intent. The result is that if someone now wants to watch our videos they have to deliberately disable Safety Mode, meaning they would then be exposed to very non-family-friendly search results and advertisements. Of course, we have notified YouTube, but at the time of writing, and after two weeks, we are still waiting for their answer. We cannot stop the negative feedback. We cannot change hearts (only God can). We cannot do anything but stand our ground and attempt to give the best answer we can to the challenges of the skeptics, even if they do not play by the same rules as us. Would you like to help? You can help us by finding and ‘liking’ our videos on our YouTube channel, by joining our FaceBook page, by ordering our materials, by spreading the truth, by your generous donations, and by prayer. Our job is to provide you with the best arguments available so that you will be more confident in sharing the Good News with a dark and fallen world. Your job is to get equipped, and Evolution’s Achilles’ Heels is designed to do just that. If the opposition is determined to keep you from knowing about it, that is just more of a reason you need to order the book today (and you might as well throw in a copy for a friend)! You can freely print out or forward these INFObytes or articles from our website to your friends, colleagues, family and even your local media. If you have had this passed on to you and wish to receive CMI INFObytes directly, please click here. If you need to change your email address or other information, or to unsubscribe, please update your profile. 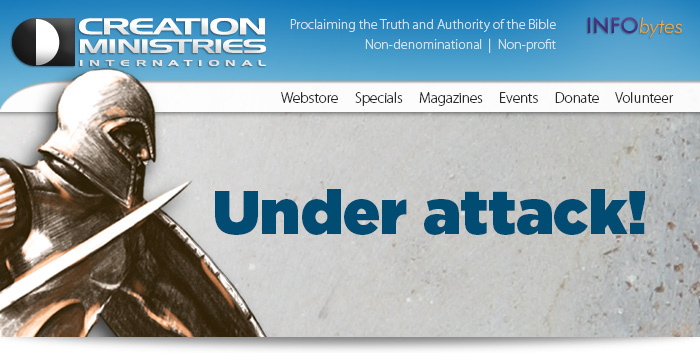 You can also subscribe or unsubscribe from our daily email here as well. PLEASE DO NOT REPLY TO THIS EMAIL. It is only used to send CMI INFObytes. © 2014 Creation Ministries International Ltd.